Triaxial Control Panels - Gilson Co.
Triaxial testing of soils is a tool for geotechnical and structural design. 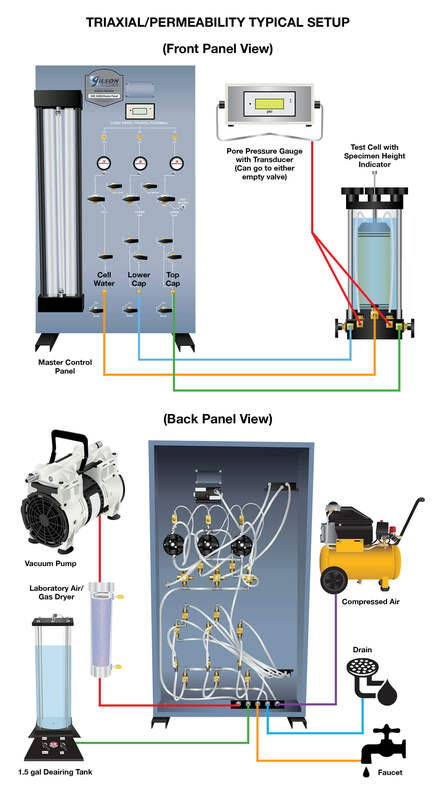 Master and Auxiliary Control Panels are required to regulate and monitor fluid and air pressures in Triaxial or Permeability Cells throughout the test cycles. Control Panels are also used in Flexible-Wall Permeability/Hydraulic Conductivity testing for verification and conformance to environmental regulations. Click here for Triaxial/Permeability typical setup. Master Control Panel includes precision regulators, valves, and reservoir and burrette assemblies to control a single test cell. The panel has an upper half that regulates air pressure to the specimen cell and a lower control to regulate the water supply. All cell and burette pressures are individually adjustable and easily monitored by a single digital pressure gauge. Auxiliary Control Panel increases productivity by allowing users to add an additional Triaxial or Permeability Test Cell and includes identical precision regulators, valves, and reservoir and burrette assemblies, but no pressure gauge.